Will Lack of The Division 2 Politics, Political Messaging Impact the Game? Will the Lack of The Division 2 Politics and Political Messaging Impact the Game? Despite our best efforts as a Division agent, the outbreak that ravaged New York City in The Division was not contained. It spread, and seven months later, the world governance as we know it has completely changed. Basic amenities became scarce—even non-existent. Forget internet, running water, or the ability to cruise down to the local store for the week’s groceries. Outbreak aside, the survivors now need to deal with a lawless frontier where bullets rule the street and the strongest military might is the one in control. 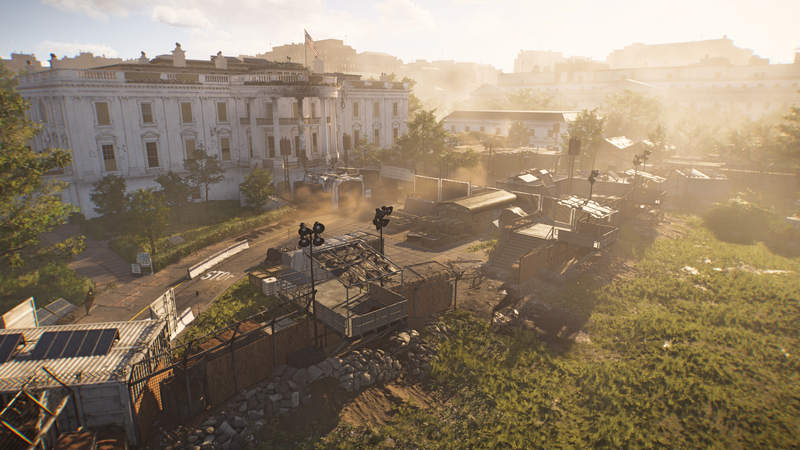 The Division 2 opens up with taking back the White House in order to use it as a base of operations. Washington DC is a symbol of leadership and hope for humanity, and if agents can reclaim this region, then maybe they can provide a place of central structure to rebuild the nation. That’s about as political as you’ll find The Division 2 getting. Even as missions have you doing things like taking back the Declaration of Independence, the relics of DC are little more than a symbol of a democracy that was. Instead of approaching any specific politics, the setting of Washington DC is a much more general idea as the heart of the nation. It’s a bit disappointing that The Division 2 won’t approach realistic sociopolitical divides that would inevitably crop up as a nation falls apart under such a crisis. It seems instead to be boiled down to its simplest nature of might, weaponry, and a generic struggle of the good guys versus the bad guys. This isn’t the first time we’ve seen Ubisoft shy away from potentially powerful and controversial messaging in a game. Far Cry 5’s rural American setting and hive of religious cultists was the perfect opportunity to explore how geography plays such a massive role in American politics, but again, much of that messaging was left on the table. The only thing that Far Cry 5 suffered as it veered away from any controversial topics was the fact that its story was pretty boring. Everything came back to the “Bliss” as the macguffin. This drug was the explanation for almost everything and allowed them to avoid taking a controversial stance in rural America. The whole time I played it, I couldn’t help but think that things could have been a hell of a lot more interesting. The Division 2 isn’t likely to suffer the same fate. There are enough other pieces in play that lacking any kind of sociopolitical messaging isn’t likely to detract from the gameplay loop. But it could put the pin in the game actually having an interesting and engaging story to tell. Art is inherently political, and removing traces of that could hamstring the narrative. From a pure marketing perspective, I understand the move. If a high profile game leans into a particular stance too much, you begin to alienate potential audiences. From a story perspective, it makes sense too. Why give any kind of commentary on the current state of politics when the world of The Division 2 is a nation that is crumbling after a viral outbreak? The Division 2’s Washington DC is nothing more than a broad symbol of the seat of power in our nation—a setting based in geography and history, rather than politics—but sweeping very real racial and gender divides under the rug when they would be ever more pronounced in this lawless post-outbreak world feels disingenuous to the otherwise realistic environment that they’ve created. Can The Division 2 tell a story rooted in the heart of America’s political landscape without actually treading that ground? It’s only further compounded when Ubisoft decides to make light of current events such as the government shutdown in an effort to market the game—again, a game that is supposedly apolitical. We can only wait to see how pronounced these themes are when the full game releases on March 15, 2019. The Division 2 preview build played at an event. Travel and accommodations were provided by Ubisoft.